Here is another dish in my "comfort food" collection. I remembered well that when I was young. I had this dish almost every single day for dinner. If I feel ill or not feeling well, this is the dish that I always ask for. Find below "Minced Pork Meatballs and Soft Bean Curd in Clear Soup"
* heat the stock in a saucepan over medium heat. I love this dish! It is also one of my favorite comfort foods, it is the best in Thailand because the tofu there is in those cylindrical tubes. Here in California they only sell tofu in square boxes :( Just not the same. 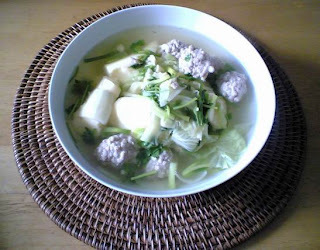 I like this dish with woon sen too ;) Great post as always! This soup recipe just made my day. My mother used to make this all the time, and I miss it terribly.